As you know Government is ready to launch GST from 1st July, 2017, Tally launch their GST ready software for their customers. Currently available release 6.0 Beta now on a Demo Basis for know the functionality of the Software. But Demo version is also ready for full function to implement GST compliances. 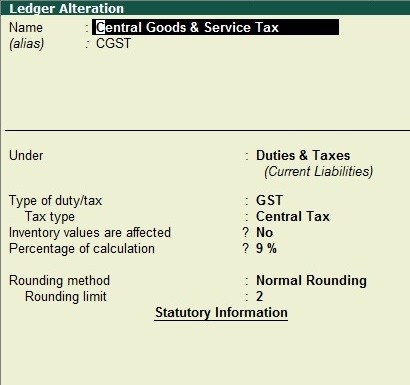 In previous post we know about how to Create GST Sales / Purchase Ledger. 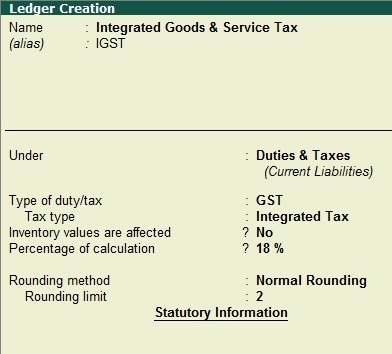 In this post we know about how to Create CGST, SGST & IGST Tax ledger in TallyERP.9 Release 6.0. 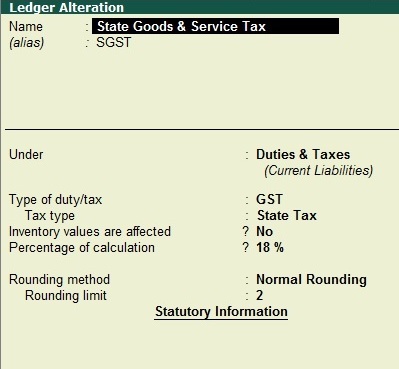 Create a Ledger IGST (Integrated Goods & Service Tax), (you can also create the SGST, CGST in the same manner), Under Duties & Taxes, Type of Duty GST (Enable GST Compliances in Tally), Select Integrated Tax, Percentage of Calculation (you also left blank calculation field because it is automatically calculated on the base of Inventory), Rounding method Normal with 2 decimal places (See below image). You can also left blank in the field Percentage of Calculation because this calculation is done by inventory tax percentage) Its all done. But remember one thing, any of the above tax ledger not work in accounting voucher before 1st July 2017. You can only use all above tax ledger on or after 1st July 2017.